This weekend has been very eventful! 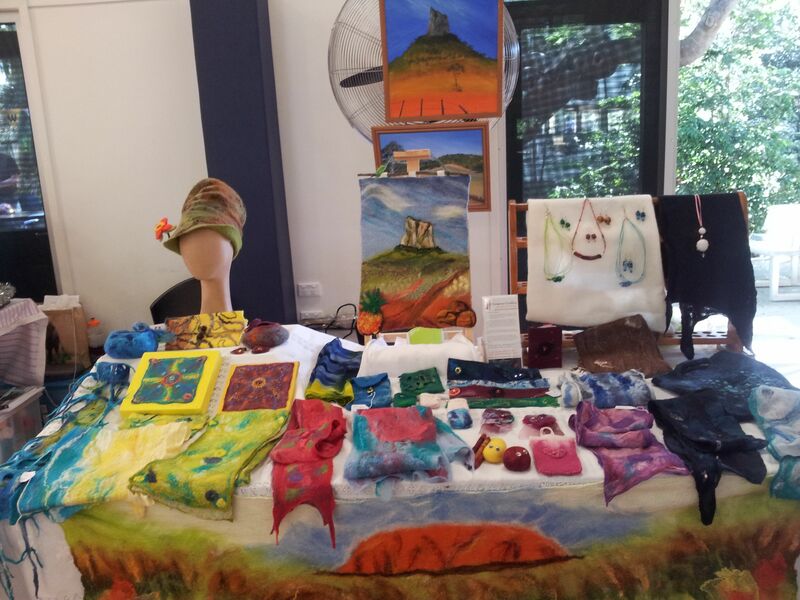 The Glasshouse Country Arts Trail has an open studio few days coinciding with school holidays – from Saturday just gone until Wednesday. I managed to complete my rose as a brooch by stitching the clasp onto the back, so it is now more than a pretty felt flower, but can be worn as well. Sunday was more productive for both of us. Sandra worked on her elephant painting which was a development fascinating to watch as she brought beautiful Mma Tembo to life using a monchrome palette. I am eager to see it finished. 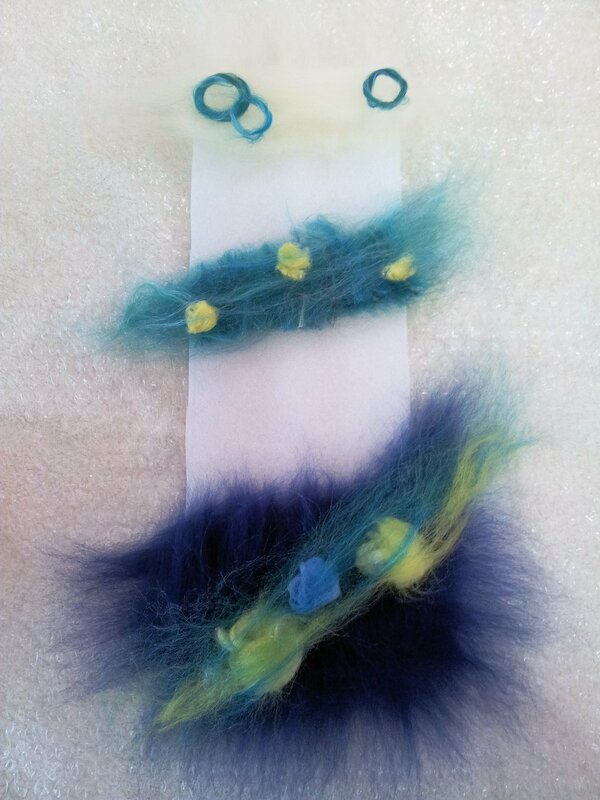 While Sandy painted, I felted. Because I was feeling quite tired this weekend, I couldn’t face a large project that would require lots of physical work, so I made two smaller pieces. The first was a little country scene that I was going to use as an insert for one of those pre-made cards that has a frame cut into the front so you can put a painting behind. 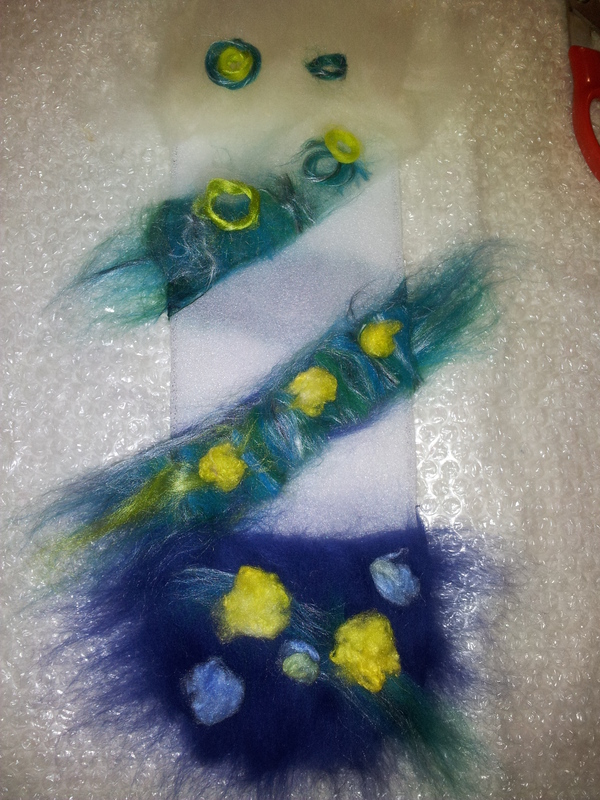 I went a bit made with the wool layout though and the whole painting turned out too large for the card. 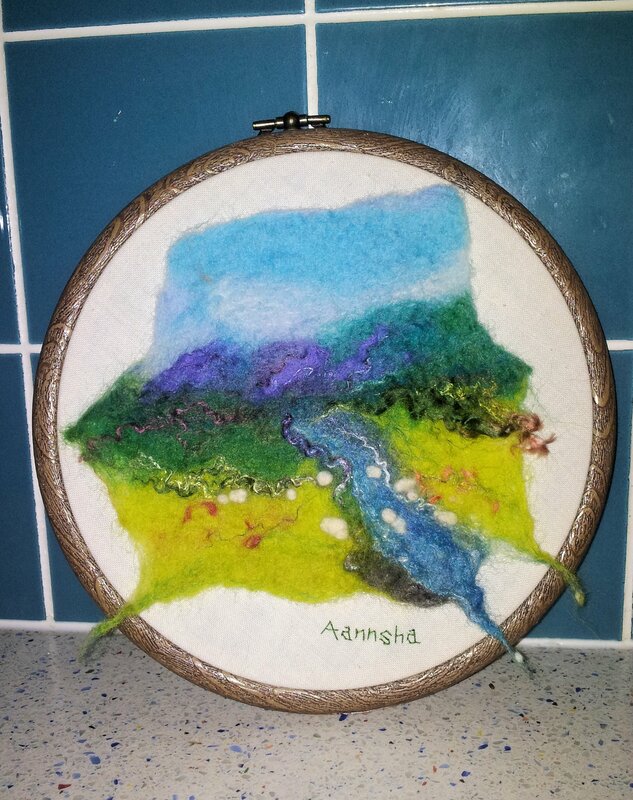 As luck would have it, Sandy happened to have the perfectly sized embroidery hoop which she suggested as a frame, so I attached the ‘painting’ to some cotton fabric and stretched it into the hoop. Some of the corners sit just over the edge of the hoop but I rather like the effect. I’m actually pleasantly surprised at how this turned out. Sandra really liked it too. I will definitely make more of these. The other smallish project I gave myself was covering the second of two tall slender glass vases I bought the other day. If you read my recent post, you’ll have seen the first one which I covered in cream/orange. This time I wanted to experiment with a completely different look. I went for a covering in totally different colours, and laid in such a way that a lot of the glass would show through. 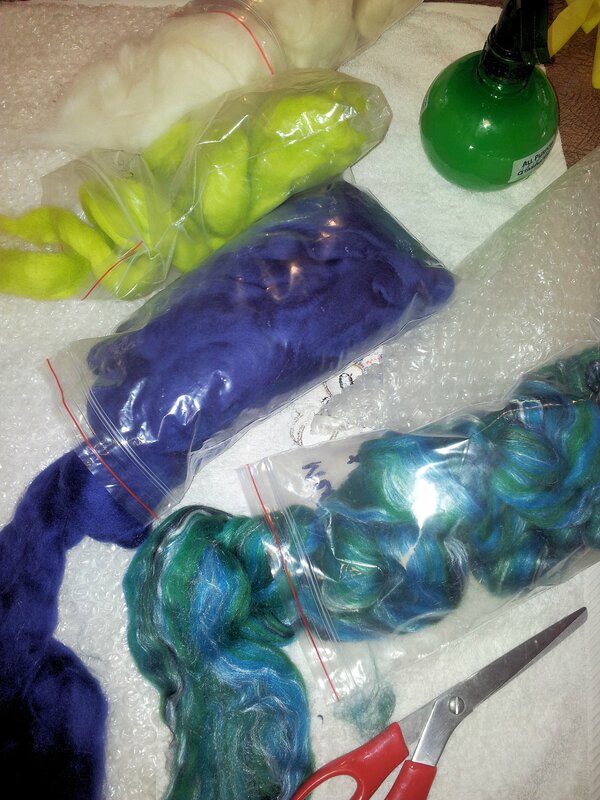 I chose dark blue, turquoise, lime green and cream as my palette. 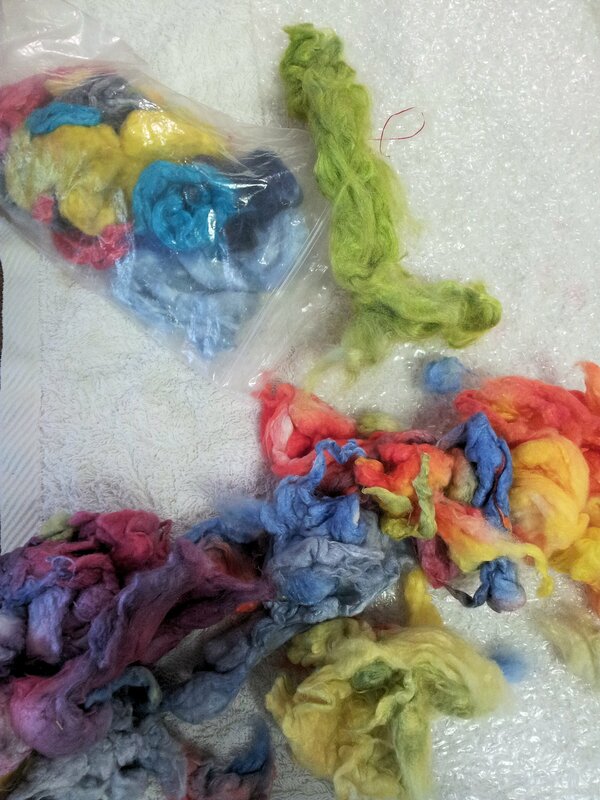 I also used blobs of silk noile for details, and some ever gorgeous and lustrous silk tops. The resist for this pattern was the same as for the last vase, as I knew it would give me a perfect fit. I’ve never made anything 3D that is open weave before, so this was guess work, but I’ve got a couple of pics of the layout front and back, that I’ll show you. As you can see, I’ve arranged the wool in such a way that it snakes up the vase. I had no idea if this would work, or if it would end up all crumpled down the bottom of the vase like some old woman’s stocking, but I couldn’t resist giving it a go! As you can see, I made the base fairly solid, and also had a rim at the top, with the rest of the wool winding around the resist. I varied the pattern using silk noile and silk tops. As it wasn’t a large piece, it didn’t take a lot of work, but I was glad that it shrank to a size that it perfectly fits the vase. Two vases, showing glass beads inside the blue covered vase. So while I made only two small pieces over the weekend, both were new territory for me, and it’s always good to stretch your creative boundaries! Arts Trail and Library Exhibits! I’m a bit excited and also a bit spread out in Beerwah this week! The latest Glasshouse Country Arts Trail is on to coincide with the school holidays and I am exhibiting with fellow Arts Trail member, Sandra Price at her studio this weekend until Wednesday. At the same time, I am displaying some of my felt at the local library for a couple of weeks in the glass cabinets at the front of the library. I will also have my Mt. Coonowrin wall hanging displayed there, as an example of the variety of uses of wet felting. I must say, it’s heart warming to have these opportunities of sharing what I love with my local community. Despite it being a wet wintry weekend, Sandra and I enjoyed another shared studio experience. While I think the weather put a lot of people from coming out so we only had a handful of visitors over the two days, we were very creative. Yesterday, she painted two in a series of three intuitive paintings, plus several beautiful bright birds and trees on small canvases. I love how Sandy can change style according to what she’s painting, so she has a variety of work that can be appreciated by many. 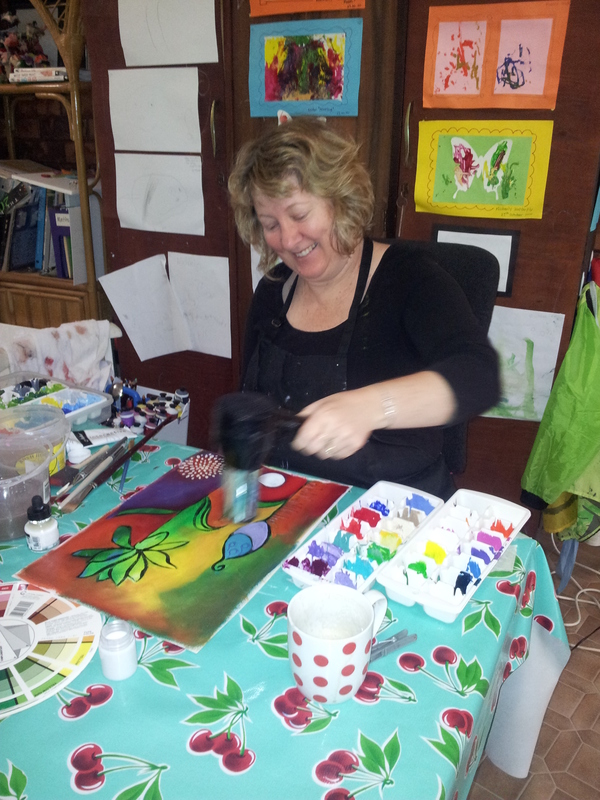 Here’s Sandra drying one of her intuitive paintings. Let’s face it, with the cool and damp weather, rather than sit around watching paint dry, you’ve gotta love technology and a handy hair dryer. Don’t you love the colours she’s using? You can read more about Sandy’s painting at her blog: Hearts Landscapes. On Saturday I made a small ‘earthenware’ coloured round bowl about 13cm in diameter. I used a muted pale blue with maroon wool and a splash of orange wool, then accentuated it with maroon sari silk threads and mulberry hand-dyed silk rovings. I then created a cobweb scarf using pale blue and pinks, a nice combination that I haven’t tried before. I was happy with how I laid out the wool rovings as the resulting scarf had a good structure that was semi-translucent and having small holes across the work which is a mark of cobweb felt. The experimental vase that looks like an upturned hat! On the Sunday I gave myself a large project, wanting to experiment with a vase/vessel using a flat resist. The two round bowls I’ve made so far have been made using a circular resist. Vessel making is a new avenue for me in felting, so when I decided to make a taller vessel, more like a vase, I wasn’t sure how to start. I went for a flat resist and threw myself into the project giving myself permission to like any outcome however outlandish, as this was an Experiment. It was actually a very big project and in order for the ‘vase’ to be sturdy enough to support its own weight, I had to work it very hard. So this baby took all day to create! I started with bright green, followed by a muted, earthy blue and did four layers alternating these colours one for each layer. When I got to the decorative layer I went mad with orange, lime green, maroon sari silk, brown alpaca and red/grey silk hankies. When I finished laying out the top layer, it looked like something the dog had thrown up on to be honest. But I was out on a limb and determined to see it through. At first, it wanted to become a handbag and I struggled to go beyond a hesitant decision to stop at that point, knowing that a bag would be a good outcome. But no. I wanted a vase or a vessel of some kind and that was what I was determined to make. I worked on it some more until I had gone beyond the handbag stiffness, and knew at that point I was on the other side. Where the vessel resided. We stopped for lunch and had a salad. Once more into the fray dear friend. Occasionally I surfaced over the green brown thing it was becoming, to look enviously at Sandra who was producing beautiful work after beautiful work – she really is industrious! I noticed that she too though was questioning her own colour choices and was surprised at how her own intuitive paintings were developing. Eventually, when it was way past cup of tea time, we both stopped. Sandra was all out of paintings, and I had finally mastered the beast! The final result was totally different to what I’d pictured when I started, and certainly a world away from a handbag, but quirky though it is, I love it. It’s a vessel that could be an upturned hat, as my son proved when I brought it home, but I reckon it works. In my attempt to flatten the bottom and create an even oval base, I used a plastic bowl that was shorter than the vessel. By the time I’d pushed the base into shape, I noticed I’d inadvertently pushed down the sides, creating deep wrinkles. Wow, that was a great accidental serendipity! I turned the top over by about four centimetres to contrast the lovely lime inside with the now muted and gorgeous autumn shades of the outside. Stepping back, I noticed the brown alpaca fleece fuzzing out in places, that adds interest. It stands about 20cm tall and 18cm wide. Here are some pictures showing the process and finished vessel. One thing Sandra and I noticed was that we’d both apparently switched colouring styles. Most of my paintings and felt carry bold, warm colours, while usually Sandra’s work tends towards blues and pastel tones – well some, not all of her work. This weekend though, I was favouring earthy colouring and using muddy browns and blues for the top layers of my work, while Sandra found herself painting in bright vibrant hues. We’re both intuitive by nature and as we worked, both occasionally uttering, “Wow, this is an odd choice of colour for my work”, we also both came to a vague conclusion that we were possibly somehow ‘tapping into’ each others’ brains and morphing our artistic palettes! There’s no proof of that of course, but it’s not out of the realm of possibility. So, that was our weekend. I am looking forward to next weekend when Open Studio weekend 3 gets underway. What will we create next? Sandra’s sister Susan came along yesterday and has written a lovely post on her blog, Daydream in Colour, about her experience. Susan is a budding felter and I was very happy to be able to do a demonstration for her, so she and the other ladies who were there could see first hand what a great process it is. It is lovely to read Susan’s blog because it gives another perspective of the Open Day from a ‘visitors’ point of view. She’s also taken some more great pics. And here’s a report from Sandra Price the lovely artist who has allowed me to use her studio as well to show my work. The report is on her blog, Heart’s Landscapes, of yesterday’s Open studio. I’d just like to say here, that it was very inspiring being able to share with Sandra, and being surrounded by her wonderful diverse art work. Our first open studios has arrived – this weekend: 22nd/23rd June! 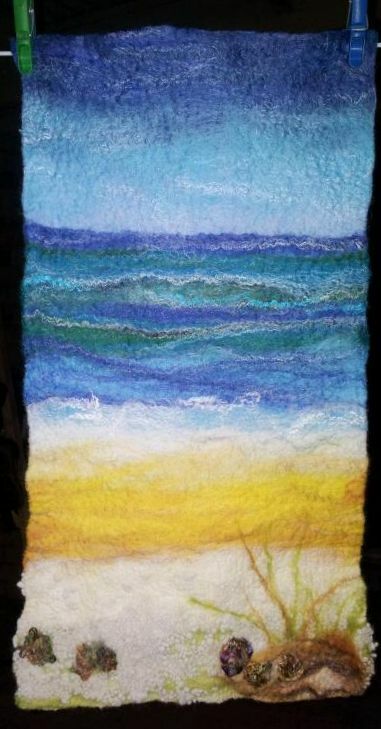 As a member of this trail, I will have my felt art available for show. 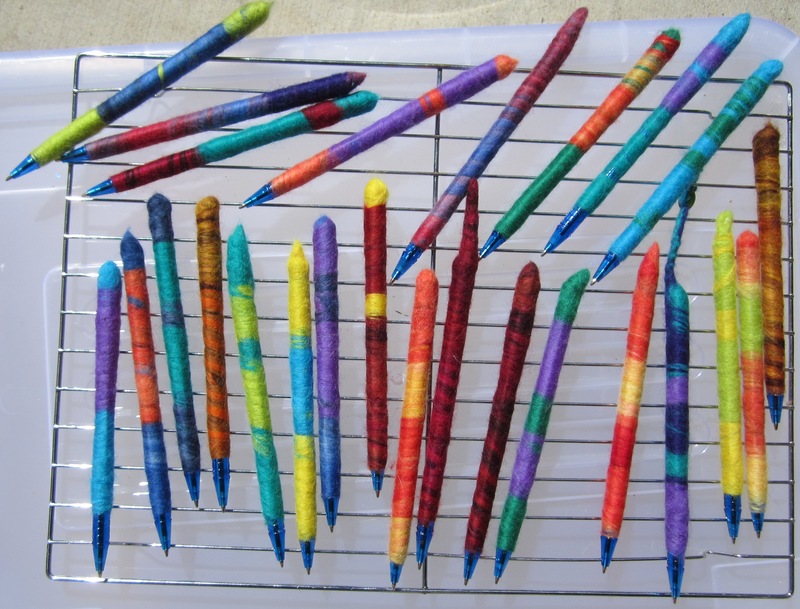 From next weekend (it runs over four weekends), I will be giving demonstrations on how to make art at the studio. Our first open studios has arrived – this weekend: 22nd/23rd June!. I’ve been away, but I’m back and on a Trail! I’ve been quiet on the posting front for a month as I’ve been visiting my mum in the UK. It was difficult to gain access to the internet as, at 92, my mum isn’t on line in any way, shape or form! 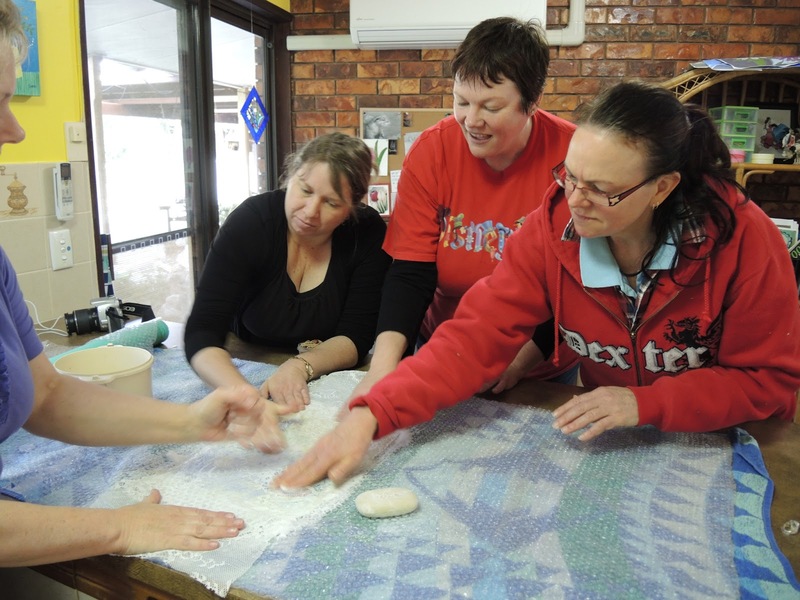 I also spent time with her, my sister and some of my relatives and friends – some of whom I haven’t seen in 25 years, so that didn’t leave any time for felting. Plus the fact that mum lives in a very small unit and her kitchen bench wouldn’t have been big enough to make anything larger than a coaster, so I left my wool and silk at home in Australia while I went on my UK trip. I’m back now though, have got over the jetlag that hits you when you’ve travelled forward in time … I think it has something to do with the magnetic fields, but who knows… and I’m ready to get creating again. 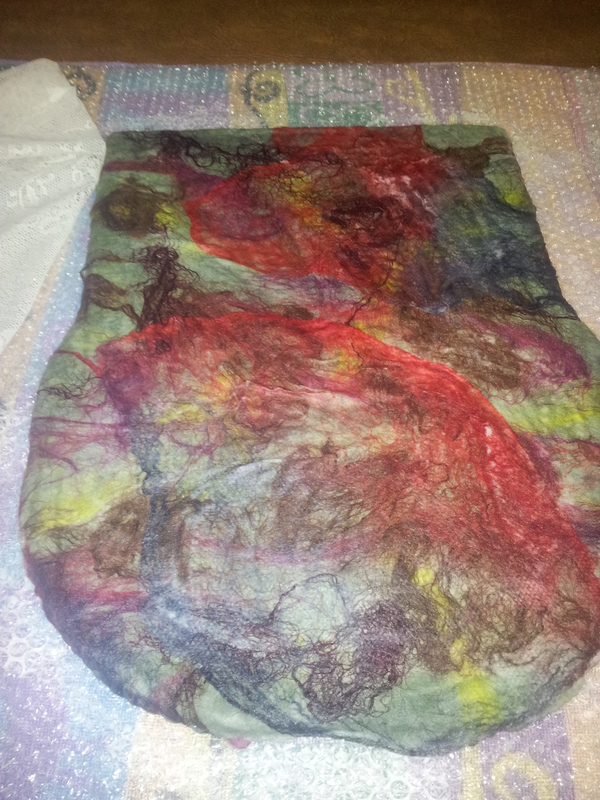 My current project isn’t as photo-friendly as my felting, as it is a ‘personal growth work book’. I won’t share any more details at the moment because it is still in the writing stage and I don’t want to give away any spoilers! and if you’re in the area you are welcome to come along and meet all ten of us who are a group of diverse artists, yet who have studios in a relatively compact area. If you’re interested in meeting us and viewing our art, check out the Arts Trail blog brochure and map. Liver Buildings from the “Royal Iris”, which is a Ferry ‘cross the Mersey.